It seems to me that the Advent is passing very quickly, am I the only one experiencing it so? When I was a kid, I just spent this period wondering about the Little Jesus (the Czech equivalent of Santa Claus) and hoping he would bring me something that I wished for but I also wanted to see him in real, to be sure he really existed. I had to do nothing else. Nowadays, several years after the big disappointment, when my cousin told me that Little Jesus was not the one who brought us presents, I usually spend this time by getting presents for people I care for, being busy with exams and later at work with year-end processes, and only when all this stress goes away for a while, I really enjoy the magical non-material atmosphere underlined by the beautiful decorations everywhere around the Holidays. So I hope that you guys are already enjoying some calm Advent moments with the ones you care for. For me, it will only start in few days, but before I go on holidays to my home country, here you have one excellent tip for little Christmas desserts – chocolate-covered prunes stuffed with marzipan. I am sure you will love them! You know why? 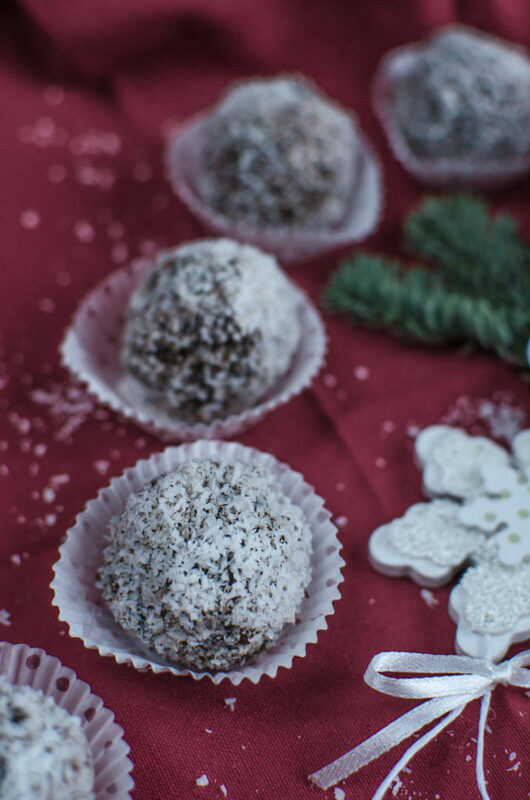 They are super easy to make, no-bake, de-li-ci-ous, and always receive a huge success! 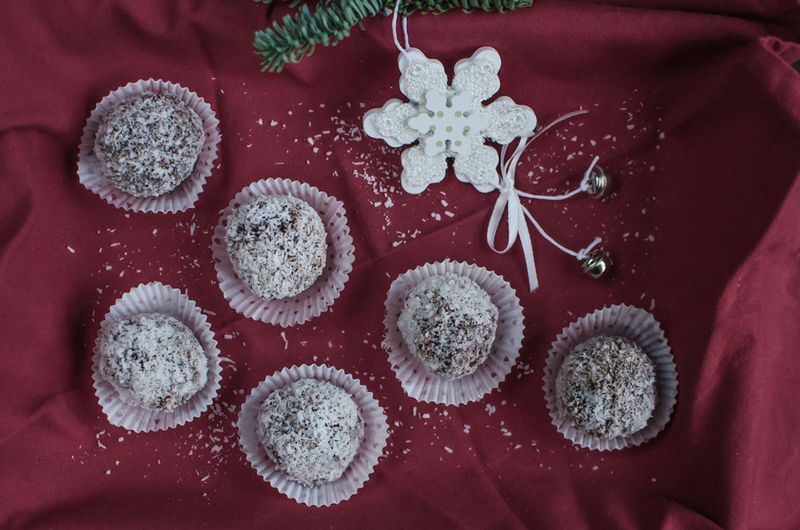 (Of course, if you like prunes and marzipan…). 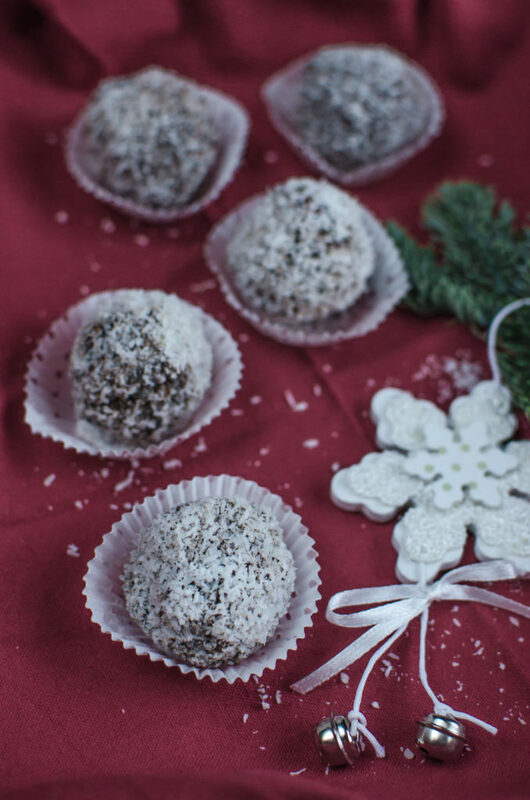 Plus, you can still make them during this weekend as they don’t need to rest several days before serving as the other baked Christmas cookies. 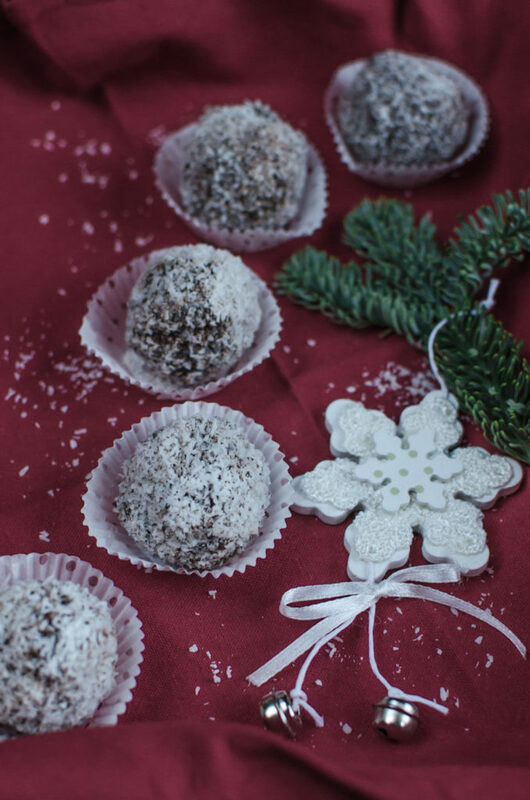 Chocolate-covered prunes stuffed with marzipan are perfect for a small Christmas dessert, they are no-bake, easy to make, delicious and people love them! Soak the pitted prunes in a Rum for few hours or overnight. Drain the prunes in the collander and then stuff each with a bit of marzipan forming small balls. 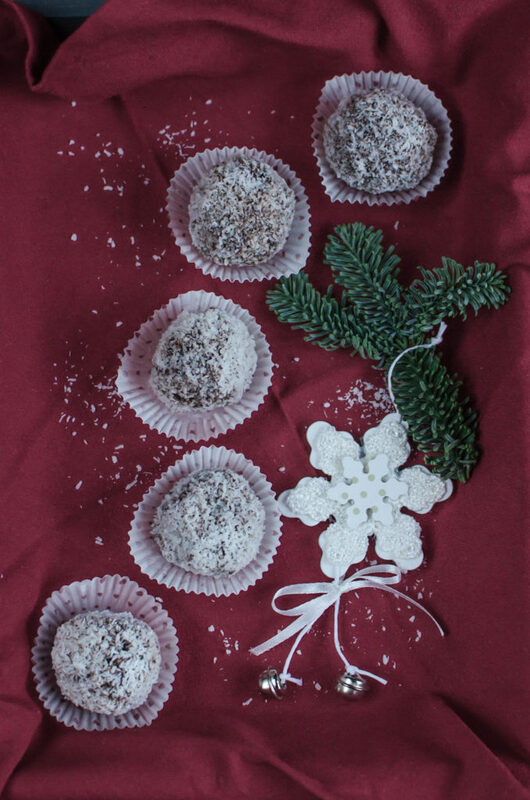 In bain-marie, heat the chocolate with butter, skewer each stuffed prune and dip it in the chocolate one by one, then coat in the shredded coconut. Place each carefully on a grid placed above a baking sheet. Place the baking sheet with chocolate-covered prunes into the fridge for few hours or overnight allowing the chocolate cover to solidify. Serve the particular balls in small papercups. When buying the prunes, take the ones that are soft, not completely dried. Also, they should be already pitted which makes the stuffing easier.